Photo: Firefighters work at the crash site after a helicopter crashed, in Cekmekoy outside Istanbul, late Monday. Feb. 11, 2019. Istanbul , Feb 12 : A military helicopter crashed Monday in a residential area of Istanbul while trying to make an emergency landing, killing four soldiers on board, Turkish officials said. The UH-1 type helicopter crashed on the grounds of a housing complex in the Cekmekoy district on Istanbul’s Asian side, Gov. Ali Yerlikaya told reporters at the site. No one on the ground was hurt. 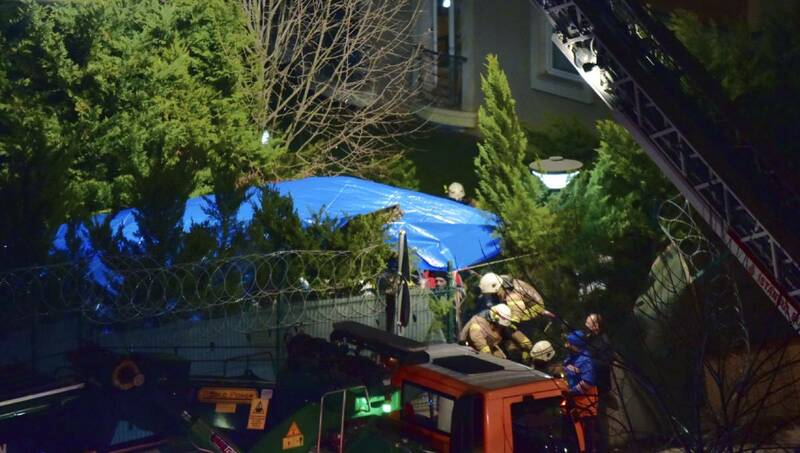 It was the second UH-1 crash in a residential area in Istanbul in the past three months. In November, a military helicopter with five soldiers on board crashed during a training mission after hitting the roof of a building in the Sancaktepe neighborhood, also on Istanbul’s Asian side. The four soldiers in Monday’s crash were hospitalized with injuries but Yerlikaya later told reporters they did not survive. The cause of the crash was not immediately known. The military said it had launched an investigation. Television images showed emergency services working near the wreckage close to children’s swings on a playground and thick smoke rising from the ground.